So I don't like potato salad and neither does my husband. In fact, neither of us like any mayonnaise based salad except tuna salad. I know he hates it, but sometimes when my friends are having a potluck, this just sounds good. I only like one kind of potato salad, and I only get a craving for it about once a year. For 4th of July this year, my friends were having a BBQ. They made pulled pork and everyone else brought the side dishes. This is the only time of year when I felt that potato salad would not only be welcome, but delicious and desired. This was the one time of year that I wanted potato sald. I only make one kind of potato salad. Actually, I take that back... I will make Japanese style potato salad from time to time. For the most part, I only make this one kind of potato salad. It's super savory and delicious from the grain mustard, dill and chopped egg. It's colorful and delicious and I love it. Like most of my recipes, I don't have a real recipe. I just add things until they taste good. Dice red onion and celery. Chop the dill finely and cut the eggs into large pieces, setting one or two eggs aside for garnish. 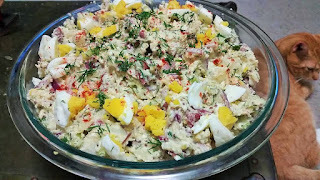 Mix onion, celery, eggs, dill, mustard, mayo, salt a pepper together. Mash some of the potatoes in between your fingers so you have large pieces and small pieces. Adjust seasoning to taste. Garnish the top with extra dill, paprika and chopped egg. Place in refrigerator until ready to serve. 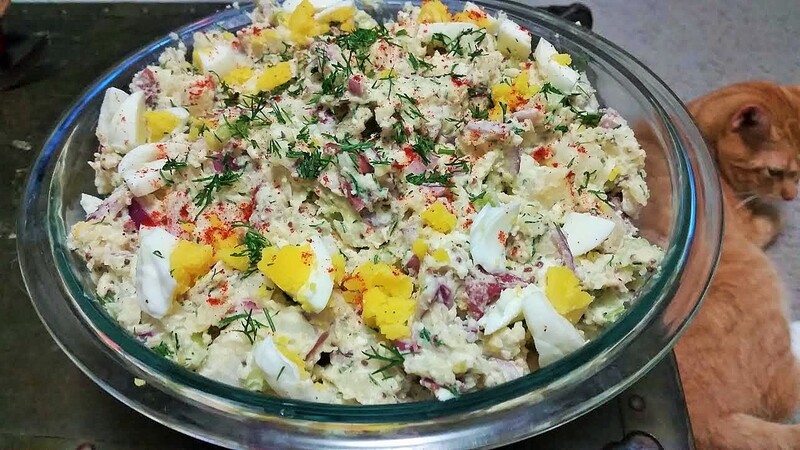 I normally don't stray from my dad's potato salad but I did recently try a dill potato salad and it was awesome as does this one.